Social sites have always had an issue with security, the more popular they get with users the more they are attacked. We can’t always blame the sites though, alot of times its the users choice of passwords, security information and information they display that is used to to hack their accounts. Facebook is by no means immune to these attacks and today it is said that Facebook Founder Mark Zuckerberg’s Facebook account was hacked sometime yesterday, it shows there are no limits to who can be hacked. Facebook has not commented on their founders page being hacked but here is a screenshot of the page before it was taken down. 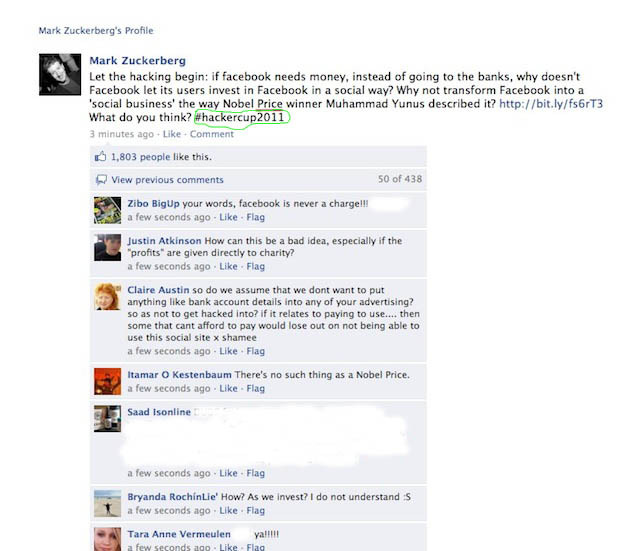 The hacker simply known as hackercup2011 did nothing more to the page other than posting the comment. This is just the latest breach in Facebook security. Facebook has been criticized many times in the past with recent breaches in user accounts such as George Bronk who just plead guilty to 7 felony charges consisting of computer intrusion, false impersonation, etc, from using Facebook as a way to gather account information and email addresses of dozens of women and then used images to blackmail the women.